Thinkingpinoy (TP) started doubting Vice-president Leni Robredo’s grasp of law when he wrote “June 30 SOCE Extension? Leni Robredo used Obsolete Rule”. In that article, I showed that Robredo used an obsolete 2013 resolution to justify the Liberal Party’s late filing. Leni Robredo, a lawyer by profession, should have known better. I discovered afterwards that Robredo failed the bar exam at least once [Inq], with some camps saying she flunked it three times. After that, Robredo condoned Pres. Aquino spokesman Edwin Lacierda’s #PisoparakayLeni fund raising drive [ABS], despite the fact that it squarely violates the RA 6713, or the Code of Ethics for Public Officials. Solicitation or acceptance of gifts. — Public officials… shall not solicit or accept, directly or indirectly… anything of monetary value from any person in the course of their official duties. So ano ba ang intellectual qualifications ni Leni para maging VP? May pagka-shunga si Ate e. Nag-tsinelas lang, tumakbo na. On 18 September 2016 or just a little over a month from now, the late dictator President Ferdinand Marcos will be buried at the Heroes’ Cemetery, the Libingan ng mga Bayani (LNMB) [CNN]. “We strongly oppose the decision to bury former President Ferdinand Marcos in the Libingan ng mga Bayani. How can we allow a hero’s burial for a man who has plundered our country and was responsible for the death and disappearance of many Filipinos? Those who have greatly committed crimes and moral turpitude to the Filipino people cannot be buried in the Libingan ng mga Bayani. This decision will not bring unity to our country; it will only deepen the unhealed wounds of the survivors and family members of victims of the terrible years under the Marcos presidency. Furthermore, his heirs continue to deny that these sins against our people happened. They continue to have no remorse and still prevent the return of the wealth that they stole. Drama aside, let's examine Robredo's statement. Marcos’ family chronically denies these allegations. Marcos’ family refuse to return ill-gotten wealth. Before we go any further, let me categorically state that I hate Ferdinand Marcos and his family, I made that plenty clear in “Robredo-versus-Marcos and Philippine Society at Large”. However, controversial issues like these are best discussed with an objective approach, like what I did in “Quantifying Discontent: An Analysis of the Bongbong Marcos Phenomenon”. Do these four reasons hold legal weight? That is, can we legally prevent Marcos’ burial in LNMB? Who can be interred in LNMB? First, let’s cite the LNMB guidelines relevant to the Marcos burial issue. In particular, let’s take a look at “Armed Forces of the Philippines (AFP) Regulations G 161-373, SUBJECT: ‘Allocation of Cemetery Plots at the LNMB’ issued on 09 April 1986 by the AFP General Headquarters under then AFP Chief of Staff Gen. Fidel V. Ramos and then President Corazon C. Aquino. Veterans of Philippine Revolution of 1896, WWI, WWII and recognized guerrillas. Government Dignitaries, Statesmen, National Artists and other deceased persons whose interment or reinterment has been approved by the Commander-in-Chief, Congress or the Secretary of National Defense. Former Presidents, Secretaries of National Defense, widows of former Presidents, Secretaries of National Defense and Chiefs of Staff. Authorized personnel who were convicted by final judgment of an offense involving moral turpitude. Does Marcos belong to any of these 10 categories? Category 1: Marcos received a Medal of Valor [Army]. Categories 2 and 10: Marcos was a Philippine President and ex-officio AFP Commander-in-Chief. Category 6: Marcos is a retired AFP personnel [Army]. Category 8: Marcos is a World War II veteran [Army]. First, if Marcos was dishonorably separated, reverted, discharged from the service. Second, if Marcos was convicted by final judgment of an offense involving moral turpitude. Unfortunately for Martial Law victims, Marcos was never dishonorably separated, reverted, or discharged from the service, as such would have required Marcos to undergo a trial, something that never happened. If Marcos was court-martialed [MCTC DLSU] that resulted in his dishonorable separation, reversion (demotion), discharge from AFP, the AFP would have been forced to remove him from their Hall of Heroes, which is not the case [Star]. In short, the first ground for disqualification does not apply in Marcos’ situation. Marcos and his family immediately flew to Hawaii at the height of the 1986 EDSA Revolution [CNN], where he died in exile three years later in 1989 [NYTimes]. He was still the president at that time time, and was thus enjoying immunity from suit. Now, it can be argued that Marcos lost the presidency when Corazon Aquino was made president in 1986, so Marcos could have been tried for moral turpitude, right? The problem, however, is that “Philippine law forbids trial in absentia in criminal cases” [NYTimes], so there could not have been any trial, much less a Final Conviction from the Supreme Court. Trial in absentia means the conduct of a trial in the absence of the accused [Duhaime]. The New York Times, however, was not very accurate in that statement. Now, suppose someone actually did try to sue Marcos back then, would “I can’t attend trial because the government and the angry yellow mob will kill me if I step foot on that country,” be an unjustifiable reason? Hence, a “conviction by final judgment” would not have been possible, so we cannot invoke the second ground for disqualification from burial in LNMB. Now, it’s time to examine Robredo’s arguments against Marcos’ burial in LNMB. They are so easy to rebut that I will only need two subheadings for this one. I am pretty sure he did commit plunder, used torture, and ordered killings. However, per Liberal Party’s favorite phrase “Rule of Law”, neither Leni nor I are qualified to decide on whether he did that or not. The Rule of Law requires presumption of innocence until found guilty by a court, something that never happened in Marcos’ case. And guess what disqualification from LNBM burials requires? A Final Conviction that’s not there. I am also pretty certain that the Marcos family did this. However, these are offenses committed by Marcos’ kin, but not Marcos himself. If there someone to be sued, it would be the Marcos Family, but not Marcos himself. Would that be an unjustifiable alibi? I do not think so, either. 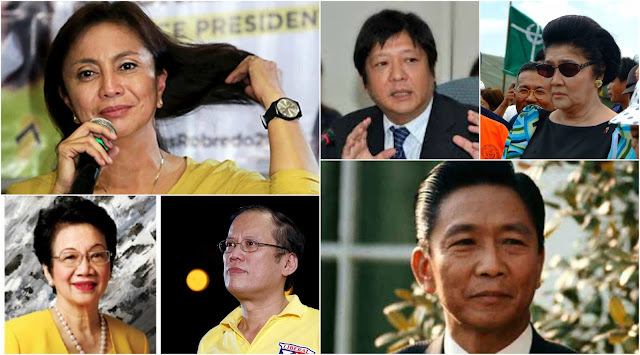 So no, Robredo’s four arguments don’t hold water. In my personal opinion, Marcos does not deserve to be buried in LNMB. However, he deserves to be buried there in accordance with the Rule of Law. Why? Because legally giving Leni what she wants means disregarding the Rule of Law. By the equal protection clause enshrined in the Bill of Rights in the 1987 Constitution [Art III], that means everyone can disregard the Rule of Law. Leni wants us to disregard the Rule of Law, so she implies that extrajudicial killings are okay. But she condemns extrajudicial killings, right? There lies the contradiction, Robredo’s contradiction. Yes, I am pretty certain right now that Robredo is a terrible, terrible lawyer. What can we still do to prevent Marcos’ LNMB burial? The irony of the entire matter is that it was Corazon Aquino herself who signed AFP Reg. G 161-373 [GMA]. She had six full years to revise it too. Her successor, Fidel Ramos, also had six years to revise it, but he did not. Cory’s own son, Benigno Aquino, had six years to revise it too, but he did not. And Robredo had three years to propose a law covering LNMB, but she’s a terrible lawyer anyway. Add the fact that Benigno Aquino himself was a senator and a congressman, but he did nothing about it. IF THERE'S SOMEONE TO BLAME FOR THIS, IT'S THE AQUINOS AND THEIR LIBERAL PARTY, WHO DID NOTHING TO REVISE THE REGULATIONS. MORONS. THIS BORDERS ON CRIMINAL NEGLIGENCE OR WORSE, CRIMINAL INCOMPETENCE. THIS IS THE SAME REASON WHY GLORIA MACAPAGAL-ARROYO GOT RELEASED. But the damage has been done, so what can we do? Go to the Supreme Court and ask them to review the constitutionality of “DND Memorandum on the interment of the late Former President Ferdinand Marcos at LNMB [PresComms]”. Leni, if you really are so passionate about not having Marcos buried in LNMB, go to the Supreme Court and file a case and ask for a temporary restraining order. But I guess you can’t, duma-drama ka nga palang wala kang pera.